It’s been a full week since returning home from Philly and I finally feel like I’m settling back into a bit of a comfortable routine here at home. I’ve never been gone for such a stretch, two whole weeks away from Chris and the kids and the flowers. By the end it was a little tough, but I’ll say the journey was certainly worth the uncomfortable spots because what I witnessed was so overwhelmingly wonderful, I’ll be inspired for years to come! 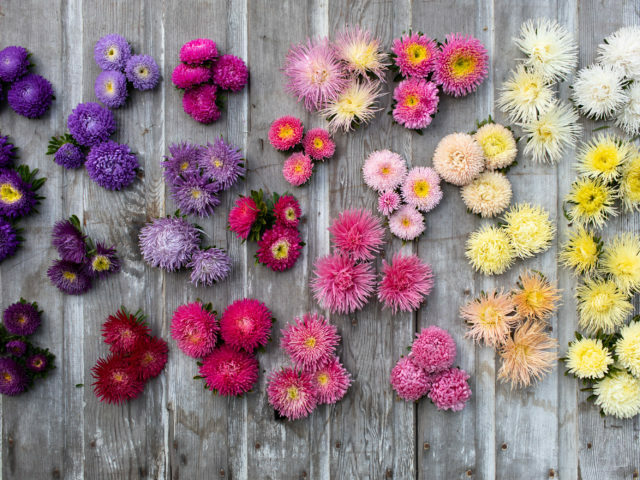 If you’ve been following along here for awhile then you’ve likely seen links to photo posts and class announcements surrounding a collaborative blog launched this spring with grower/designer Jennie Love titled The Seasonal Bouquet Project. For the full back story on how it all got rolling, you can read this post. In a nut shell, Jennie and I dared each other to make a bouquet every week, for the entire season using only locally sourced flowers. Living on opposite coast, in very different climates, with very different taste, we wanted to see what was happening in each others garden and keep creatively connected during the roller coaster that is the flower season. Some weeks the project felt like pulling teeth and others it was my favorite creative endeavor. Every seven days, the garden had something new to offer and it was our job to showcase that magic in the most beautiful light possible. All in all, it was one of the most rewarding processes I’ve invested in so far. A few months in and dozens and dozens of sweet emails later, it was obvious that our small flame of an idea was catching fire in the lives of others. Growers and designers from all over the world we excited and eager to not only participate in the weekly ritual but to also come together and learn more in person. I give Jennie full credit for being the brave force behind launching the workshop series. She went to great lengths to bring us all together in one place and put so much of her heart and soul into nurturing the idea all the way into form. Sixty six sweet souls left their farms, floral businesses and lives to travel from all corners of the globe and be part of this new movement. There was so much excitement and enthusiasm present in the group that it was impossible not to leave completely inspired. Change is underfoot indeed and I cant wait to see what happens from here!!! In the coming weeks we will be sharing many more details from the classes, beautiful photos of the experience captured by some of Philly’s best photographers and our plans for the future on The Seasonal Bouquet Project blog. I will be sure to link to any and all of the new developments here as well. 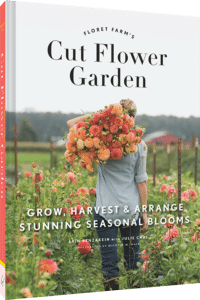 While knee deep in the workshop series, Jennie and I sat down with author Debra Prinzing for a fun interview about the local flower scene, The Seasonal Bouquet Project and the new and growing movement of farmer/florists coming onto the scene. 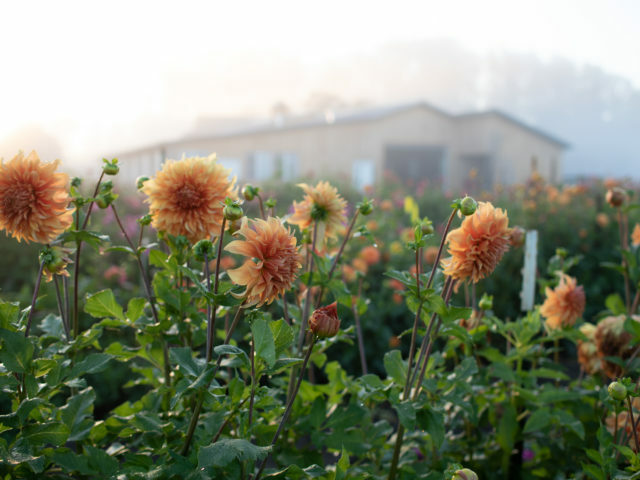 Are you a budding flower farmer? 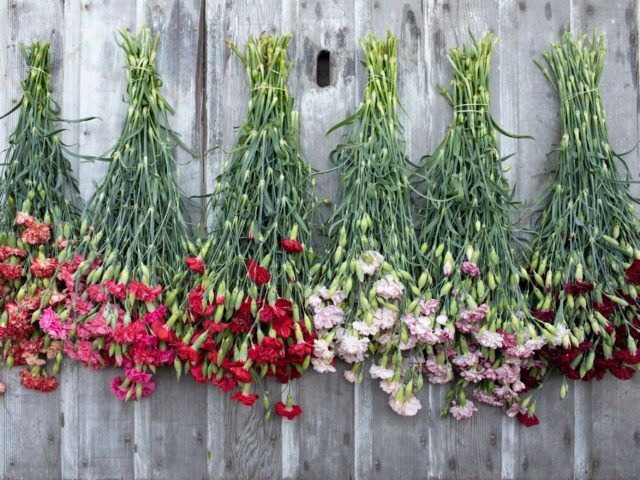 Are you a floral designer wanting to use more seasonal material in your design work? What resources do you feel are lacking and what do you need in order to soar? I’d really, really love to know more about your journey and any of the roadblocks you’re experiencing in the comment section below. Congratulations on the success of your Seasonal Bouquet project in PA. Clearly you’ve captured the hearts and minds of many, yet there are so many more who have not yet been touched by the work you and Jennie are doing. I hope your effort continues and I hope we can continue to support you in your mission to help people think more creatively, regionally and locally when designing with flowers. Thanks Kasey! Your support was absolutely fantastic and so well received by all of our lucky students. We were all oohing and ahhhing over the fun CA foliages that none of us ever get to grow. A real treat indeed! wow! I’m so happy you would consider Salt Spring.I am having trouble emailing you.Maybe it would work if I replied to one of your emails to me? Thanks! Did you send to [email protected]? Put Salt Spring in the subject line. The seasonal, local and organic flower arranging philosophy has not really caught on in New Zealand yet and its very reassuring and inspiring to know there are like minded people out there, even if scattered across the globe. This is my first year growing my own flowers in my little garden to supplement what we get at the flower market (I can see how it’s very addictive and easy to run out of room) and so much advice and knowledge has come via the internet community. Looking forward to your e-book soon, exciting news! I forgot to mention that I’ve found it impossible to find anyone who can sell me ranunculus corms this fall. I’m so sad that I won’t be getting a head start with them in my hoop house.How did you begin your first crop? Also, here’s an idea…….come to SaltSpring and speak at my (huge!) Garden Club and help me encourage gardeners to grow for my future flower shop! I think coming to Salt Spring is a grand idea, I’ve always wanted to visit! Not sure if you know Michael Ableman from Foxglove Farm, he’s on the island, but it was his book that inspired me to start farming. I’ve longed to see his operation for many years now. Thank you so much for your generous sharing of everything that you do. I’ve been following your blog for about a year now and can’t tell you enough how thankful I am for your inspiration and knowledge. I’m working on growing on my 3/4 acres here on Salt Spring Island, B.C. We have the most amazing community of farmers and an incredible farmer’s market.My hope is to open a flower shop which is purely locally supplied….and no oasis allowed! I hope that some day I get to meet you at one of your workshops or maybe you will come visit Salt Spring one day! Many, many thanks to you Erin. Hello from a very cold and frosty Aberdeen in the north east of Scotland. I have been enjoying all your photographs and updates for the first time this year. Your work is beautiful. I have been in the wedding industry for around nine years now, and had my own events business for two. If there is one thing I have noticed, is that florists are not too keen to think outside the box and go local and seasonal. This last year I was asked by three brides to help with some flowers as no one in our area does anything seasonal, or using local flowers. One of my brides, after coming to my house for a consultation asked if they could buy the flowers from my garden for their wedding flowers. We did this, a combination of my own and from my mums garden. It was a riot of colour and looked beautiful. This got my brain whizzing. I have booked myself into the local college for a course starting in the new year, to learn some more technical aspects that I am missing. But my biggest problem lies in sourcing enough of the flowers, and we are so dependant on our weather. We had a stunning summer this year, and the garden was beautiful, but some years we get lot and lots of rain, and not enough sun, like the year before. I have four children , which also limits my time in the garden. I have thought about putting an ad in the local paper asking for local gardeners that would be willing to sell me their Dahlias, sweet peas, delphiniums etc for weddings and events. I have also discussed with my mum about taking over a part of her garden to grow some specific flowers for cutting. One way or another, I am going to try and make this work. There is a gap in the market here for seasonal, less structured flowers and I think I would like to take that on. I would also really love to know more abut conditioning flowers after they have been cut. Wow, what an exciting project you are about to embark on! There does seem to be such a gap in the floral market doesn’t there? How very thrilling for all of us. Do you know who Sarah Raven is? She has written two fantastic flower growing/arranging books and is based in England. Her growing advice is always spot and though your climate is a bit soggier than hers, much of it should be applicable. Thank you for your reply. I love Sarah Raven. I have ordered seeds from her before, and I watch her youtube tutorials. I will look in to her books though. Thank you! You are one amazing women! I would have loved to attend the workshop with you and Jennie and see her farm! Visiting your farm was such an inspiration! 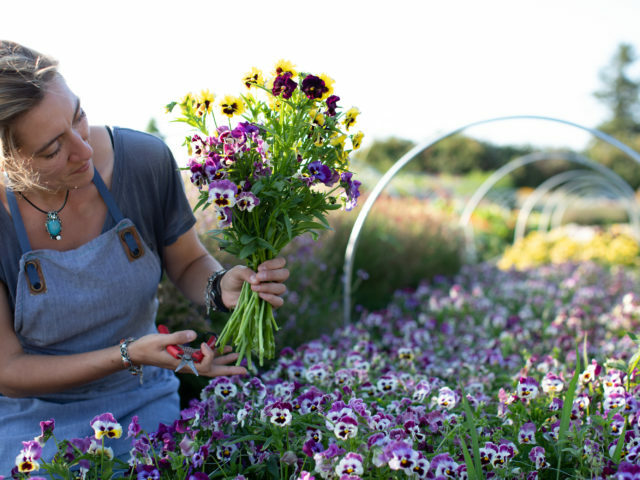 The seasonal bouquet project and just being able to see what others are doing, creating this community of floral designer/farmers, everything, is headed in an wonderfully exciting direction! You are doing such a wonderful job keeping everyone connected and keeping the conversation going! Thank you! Congratulations, Erin, on such a tremendously successful project and rousing finale to the season! It was such a pleasure to work on the videos and I can’t wait until the book is released. Happy weekend to you all. Your site is an inspiration! I have had a cutting garden for years and finally have a deer fence so feel enthused to add many more plants. I appreciate your sharing plant varieties,seed sources and growing tips. As a painter I enjoy your artistry with flowers, keep up the excellent work. I JUST graduated from Washington State University with a degree in Landscape, Nursery and Greenhouse Management. What I would really love to do is become a florist. WSU cancelled their flower arranging class some years ago, so now I am having trouble with just learning the ways of arranging flowers. I have zero experience, except for the little amount we did in Hort Club there. I absolutely loved it, but now don’t know where to go or what to do next. A floral arranging class would be wonderful to attend just to learn the basics. One for beginners. Do you know of any or have any advice on what to do next? Love this project. I’m a florist in Madison, WI and I ONLY use locally grown material. You heard me right. In Wisconsin of all places. 12 months of the year. My website has a photo slideshow organized by month to give you an idea of how we make it happen. It can be done! Fantastic! and in WI? that’s amazing. I’m a young organic farmer and I mostly make my living from vegetables. I am aspiring to add cut flowers as a profitable part of our farm (I am currently considering it a personal educational project). My biggest challenge with incorporating it into our farm is learning efficiencies (especially with bouquet making and harvest…like leaf stripping) as well as figuring out pricing. I thank you for the time you spend writing blog posts, articles for Growing for Market, and social media. 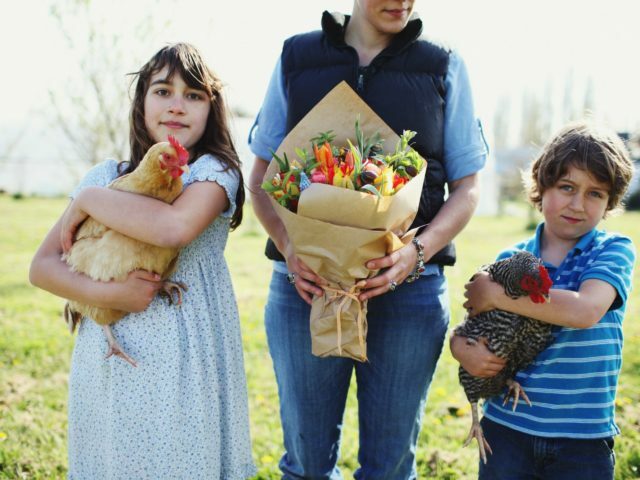 I have been watching your gorgeous farm grow and reading your blog for a few years now – it has inspired me to start a farm! I’ve been a designer for 10ish years, and I work on a flower farm one day a week during the summer (if I have time!). I’m located in Madison, Wisconsin, and the biggest issue is the SHORT growing season here! I’m busy expanding the farms I buy from, even fedexing roses and other flowers from the west coast, but buying locally is also important to me! Our winters don’t allow for the abundance available in Washington or California or Oregon. I don’t have access locally to huge garden roses, crazy awesome ranunculus, hundreds of dahlias, interesting blooming branches, etc! I want my designs to reflect the seasons and respect our location, but I also want them to be more sophisticated than the local farmers’ market! Do I have to move or accept the distance? I’m a budding flower farmer trying to find mentors in the same climate as mine (southeast) to help me troubleshoot. Would love to know more about how you started and see more pics of your set-up / layout of the farm. You’re the best! I agree on the technical aspects.. I can take a local intensive flower arranging class, but it is of traditional florist style, using more traditional shipped in material. I know what I want to use, and the color combinations I can envision, however the technical side.. like how to hold stems while making the bouquet, how you get your large arrangements to sit in that compote easily etc..
Plus, a general frank discussion on pricing would be awesome. Lovely photos, I can’t wait to see more! My brain has been abuzz with ideas (some crazy ones!) since I got back from the workshop… Being a designer with no serious intent to grow anything other than what I can fit in my tiny back yard, my biggest obstacle is finding growers willing to sell me their product. Crazy, right? And I just spent 2 days with growers who were wondering where to find clients for their flowers… So I think what we need is some sort of forum where we can all share and exchange ideas and tips, and where designers and growers can connect. Let’s get rid of all these middlemen! I think that’s a fantastic idea!!! Let’s do it! We have The British Flower Collective here for exactly that reason. We can help each other, growing tips, outlets for our flowers, packaging and surplus stock you name it we can pull together and work out a solution. I’d highly recommend setting up something similar – we a have a new website if you want to take a peek. Erin have been following you for a while now and as you know tweeting like mad about a book with a planting diary would be great. It’s getting crop rotation right in a small area for us and when you have a cold spring like we did it makes it very tough to get those early annuals! Oh, I can’t wait to check out the new site! I am so restless to get moving on that book. I have my feelers out now so hopefully it’ll happen in the not so distant future. Thrilled you had such success with dahlias, aren’t they the best!? And mums…you’re gonna flip! Another thing I struggle with is know the technical aspects of designing. There are no floral workshops here in the Boulderr/Denver area and I can’t afford to travel right now. I just want to get some basics under my belt so that I can experiment more and eventually create professional looking designs. Lynn B. (author of The Flower Farmer) and I are creating an e-book that also includes 5 how-to arranging videos that should help tremendously. It’ll be out by Christmas and will certainly give you a good start! It’s been two years now were I’ve been planting a cutting garden. Plenty of tulips, peonies, dahlias, muscari, hellebores, clematis, mock orange, ranunculus, forsythia and on the list for next year sweet peas. My biggest hurdle to date is trying to find bulbs, seeds of unusual varieties that I can plant. I cannot seem to find the unusual colors, the fun foliages that I can plant and see grow. All I find is the usual suspects in colors…… Where can I buy the usual varieties. My local nursery will not even order them for me. Hi Erin, I have followed your blog since the spring of this year, and thanks to you and other inspiring designers/growers out there have fallen in love with flowers. I have a background in organic vegetable farming, having worked on three organic farms in the Boulder area over the last 4 years. I have knowledge and drive to grow, and an obsession with arranging and learning about designing with flowers. I know I have an eye for both growing and designing–My biggest obstacle right now is land. Land comes at a premium here in Boulder County and while I am pretty sure I won’t be able to buy land, renting land with water, or a house with land and water is hard to come by too. I have entered a deal with some family members who own a farm here to start growing flowers in some of their landscape beds in exchange for them buying seeds and plants. But I know this little bit of land will not be enough for my ever expanding list of must-haves to grow and design with. For now it is a wonderful opportunity that I will take and run with. Oh how I envy the 2 acres that you have to plant with whatever you desire!! Thank you for being the standard that I strive toward. Thank you for your generosity in sharing with us how we all can add beauty to the world. You are so sweet! Keep at it, in no time you’ll have a little plot of your own. 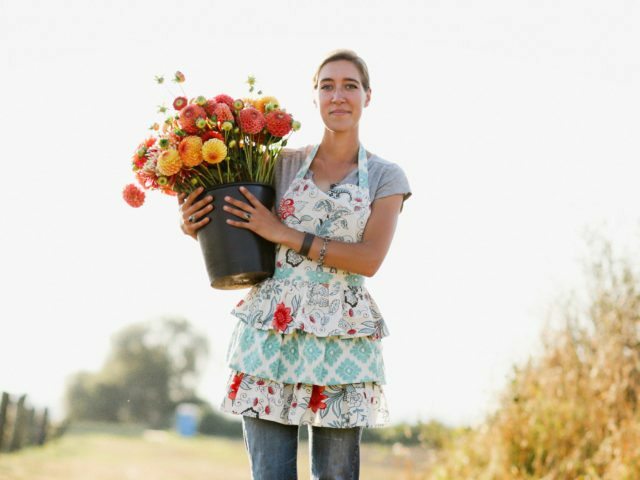 Erin–I am a newbe/wanna be flower farmer here in the Pacific NW. I have learned so much from you on your blog and FB and Instagram, and I appreciate how you generously share your ideas and pictures. From you I gain inspiration to go on with this dream of mine (I am starting very small on my own acre). I keep crossing my fingers that you will offer classes in our area since I pretty much need to learn everything about floral arranging and flower farming. I love the flower farmer community and how supportive they are with each other! Been following you for years and devouring every drop of wisdom you share. I have been flower farming since 2005, I have plenty of customers but it’s just me and I can’t keep up. I need to find someone as passionate about flowers and floral design as I am so I’m hoping that person will manifest soon. That is what I am lacking if you know of anyone send them my way. Please keep posting flower arrangements/bouquets. You have no idea how happy they make me to see them. I’ve always made flower arrangements from my own garden and this site inspired me to post pictures of them on my FB page. People love it. I’d be interested to see what can be done in the winter months. You know, greens, berries, pine cones, etc. Please continue to do the seasonal bouquet project and workshops. I want so badly to come, and it just wasn’t in the cards this year. I have already started saving and planning for next year. Having this weekly indulgence of beauty and inspiration has created a new burning love for my business. Thank you so much, we have all been so blessed by your bravery and commitment with this project. Great job! I so wish I could have been there!